The Chambersburg track & field teams knew they had a tough assignment Thursday afternoon against Cumberland Valley. Chambersburg's boys and girls track & field teams opened the season with a meet against Cumberland Valley, Tuesday. OVERMATCHED: The Chambersburg track & field teams knew they had a tough assignment Thursday afternoon when they opened their season against perennial powerhouse Cumberland Valley. And the scores reflected that - the Eagles won the girls meet 92-58, while the boys meet was 91.5-58.5 in CV’s favor. “We had only three wins on the track and four in the field, and didn’t win any relays, so CV was clearly the better team today,” Trojan boys coach Bob Walker said. Cirsten Kelly had a big day for the Trojan girls by winning the 100 in 12.7, the 200 in 27.0 and the 400 in 1:00 flat. “I was thrilled to see that a recent hamstring issue appears to be doing well,” Monheim said. Reagan Winebrenner captured the shot put (35-10.75) and discus (100-3). In the 1600, Abby Yourkavitch ran a 5:17.6 to finish close behind CV’s Mady Clahane (5:15.2) in a dual of state-caliber runners. For the boys, Kelton Chastulik had a good day for the Trojans, taking the shot put (53-0.25) and discus (154-1), while teammate Myles Braxton was second in both. Kory Harris won the 100 (11.0) and 200 (23.0), and other Trojan winners included Evan Vink in the pole vault (12-6), Nathan Reed in the triple jump (41-4.75) and freshman Trayton Barnette in the 110 hurdles (16.1). “That was Trayton’s first hurdles race and that’s a good early season time. If he applies himself, he could become an elite hurdler,” Walker said. 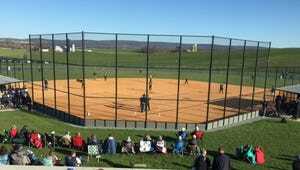 SHIP’S BATS WERE ON FIRE: The Shippensburg softball team was not lacking for offense on Tuesday in a 14-10 win over Mechanicsburg. The Lady Hounds rapped out 18 hits and used an eight-run explosion in the second inning to prevail. Morgan Fetter had the big hit in the second, a bases-loaded triple. The Wildcats got back to within 10-8 after five innings, but Sami Barmont hit a two-run homer for the Hounds (1-0), Taylor Davidson doubled and came home on Maddie Miller’s base hit. Barmont was 4-for-5 with three RBIs, and Miller was 3-for-4. 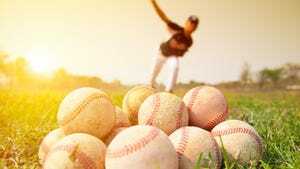 TRIPLES SET THE SCENE: Forbes Road used some hot bats to secure a solid 14-4 win over Fannett-Metal in a Sideling Hill League/Inter-County Conference baseball game. The Cardinals scored seven runs in the top of the seventh to give them a nice cushion over the Tigers. Brycen Hohman went 3-for-5 for Forbes Road with two triples. Matt Brown and Trey Kennedy also hit triples for the Cardinals (1-1, 1-1 SHL/ICC). But while batting was on key, Forbes Road pitchers walked three batters and hit six others. Fannett-Metal had only four hits. "We still have not got our bats going as a team yet," Fannett-Metal coach Jamie Funk said. "We could not take advantage of (the walks)." For the Tigers (0-2, 0-2 SHL/ICC), Cole Funk scored three of their four runs, going 2-for-3 and stealing five bases. "We just need to back that up with defense," Funk said. McConnellsburg 3, Everett 2 (10 inn. ): McConnellsburg capitalized on an error in the 10th inning. Matt Huston hit a ball to second that was misplayed to bring home Weston Brunner with two outs. Brice Feagley was the winning pitcher for McConnellsburg (1-0, 1-0 SHL/ICC). Southern Fulton 11, Tussey Mountain 1: Southern Fulton's Zach Clark was limited to 65 pitches, but didn’t need it, throwing a five-inning complete game. Clark also hit an RBI double, while Trent Rider was 2-for-2 with four RBIs. Shenandoah Valley 16, Shalom Christian 1: Nate McKee was 2-for-2 for the Flames (0-1, 0-1 MDCC). Colby Maun had the team’s only run with an RBI double. Fannett-Metal 10, Forbes Road 0: Fannett-Metal's Brooke Harris threw a five-inning one-hitter with nine strikeouts for the Lady Tigers (2-1, 1-1 SHL/ICC). Morgan Ritchey nearly completed hitting for the cycle, going 3-for-4 with a single, double and triple, with two RBIs. Forbes Road is 1-1, 1-1 SHL/ICC. Everett 15, McConnellsburg 4: Everett scored eight runs in the opening frame. Justice Seville hit a double for McConnellsburg (0-2, 0-1 SHL/ICC). Tussey Mountain 14, Southern Fulton 9: Despite racking up a 7-0 lead early, Southern Fulton (0-2, 0-2 SHL/ICC) lost to Tussey Mountain in eight innings. Lakyn Morton had three hits and two RBIs for SF. Boys, Boiling Springs 78, Shippensburg 72: Cody Gustafson won the high jump and triple jump and Taha Shamshudin took the 110 hurdles and 400 for Ship. Boys, Waynesboro 90, Big Spring 55: Ogo Akamelu captured the 110 and 300 hurdles and triple jump for the Indians. Girls, Shippensburg 76, Boiling Springs 74: The Lady Hounds opened with a narrow victory over the Bubblers. The highlight was a winning pole vault of 8-4 by Natalie Nye that broke the Ship school record. Girls, Big Spring 108, Waynesboro 42. For the Maidens, Rachel Johnson set a school record in winning the pole vault at 9-9. Chambersburg 5, Susquehanna Twp. 0: Jay Padalia, Naushair Hussain and Andrew Mooney won in singles, while the teams of Aaron Muldowney-Josh Muldowney and Ben Grove-Danny Muldowney took doubles wins for the Trojans (2-0). James Buchanan 5, Tussey Mountain 0: The Rockets raised their record to 5-0 by downing the Titans in a non-league match. All five matches went only two sets. John Handley 7, Mercersburg Academy 0: John Handley won every singles match in straight sets, except for No. 1, in which the Blue Storm’s Elliot Hicks fell 10-4 in a tiebreaker after winning 7-5 in the second set. Mercersburg Academy 12, West Shore Warriors 6: Amanda Broyles led the way for the Blue Storm (1-0) with six goals, while Elizabeth Fitzgerald and Sarah Perryman had two each. Shenandoah Valley 5, Shalom Christian 4: Shalom Christian had a 23-game winning streak halted when SVCA’s Rebekah Max scored her third goal with 12 minutes left. For the Flames (0-1, 0-1 MDCC), Lexy Poe scored three goals and Brooke Emge had one.